I've spent the last couple of days in Venice which, as everyone knows, is a beautiful city. 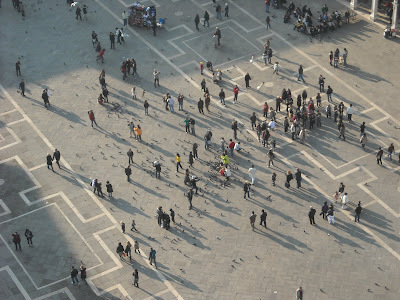 Yesterday I spent time at the Piazza di San Marco or St. Mark's Square. 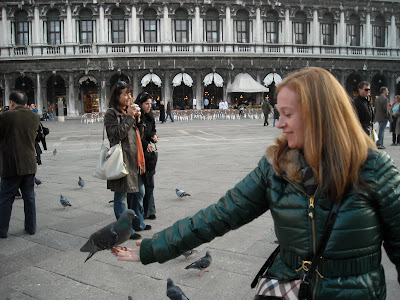 There were so many amazing things to look at but I was taken with the pigeons. 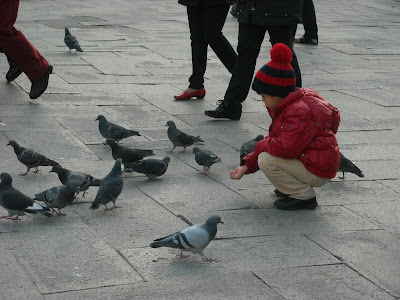 There were hundreds of people (including many kids) feeding and playing with the birds. 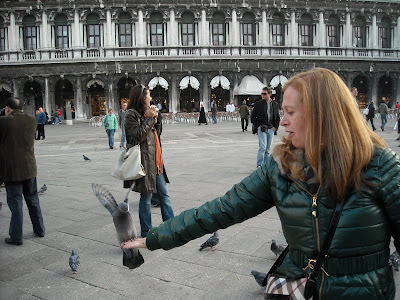 All I could think of was the song "Feed the Birds" from Mary Poppins. That song was one of Kate's favorites and she knew all the words to all of the verses. I wish she could have been there with me yesterday. 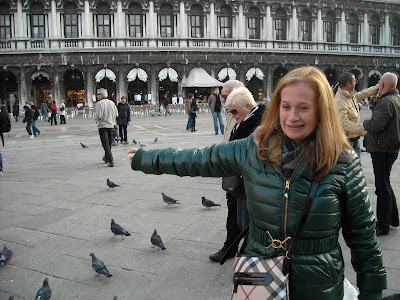 Many people were actually allowing the pigeons to land on their arms, shoulders and heads which seemed a little crazy but I thought, 'hey, why not?!' So here are some pictures of me with the birds. It's obvious (and hilarious) how uncomfortable I was at first. I was afraid their claws would dig into me or they'd peck me with their beaks. Instead, they were the most graceful, gentle animals I have ever touched. 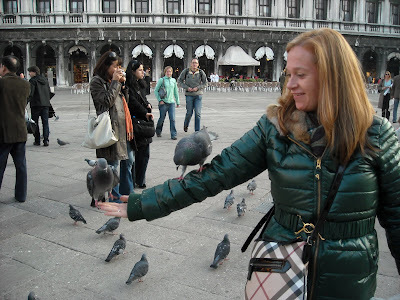 As strange as this may sound, having those birds land on my arm was the highlight of my trip to Italy so far. It was truly amazing! Love it! That last pic says it all. Amy, I will never think of a pigeon in quite the same way again. It turns out that any animal, even the most common bird in the world, can be a divine messenger. 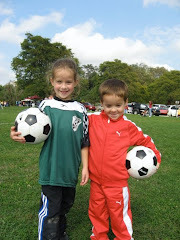 I am praying for more and more amazing, gentle little moments like these in your life. Karlin said it perfectly....well said. The greatest battle is with yourself. I've tried to escape or pre-occupy myself in the past, you can go on vacation, but you are always with you. No matter where you are, there you are. This is where the hard work begins. Isolation forces it. Good Luck. Keep reaching out. The tinest comment or blurb can lead to a significant insight about yourself. I'm glad you're travelling down the path with this blog that you are not caring what others think. I've recently embarked on that path myself. I love the bit about the school supplies especially. Reminds me of a director who shoots psychological drama very well, ...Darren Aronofsky. He did PI first, but the one I would recommend is: "Requiem for a Dream". I love this! I think Kate and Peter were totally with you while you were there doing this....enjoying every moment and definitely very proud of their "mama." You are so amazing for continuing to push yourself and face your fears (what's left of them) and to just keep going in a positive direction...it's truy inspiring and I'm really happy to be your friend and share your journey with you. And I'm soo psyched about you going to the cooking school...i think it's going to be simply amazing for you--and I still say that I can't wait to see you on Top Chef : ) Love you. by Mary E. Frye, 1905-2004, a housewife from Dayton Ohio I believe.